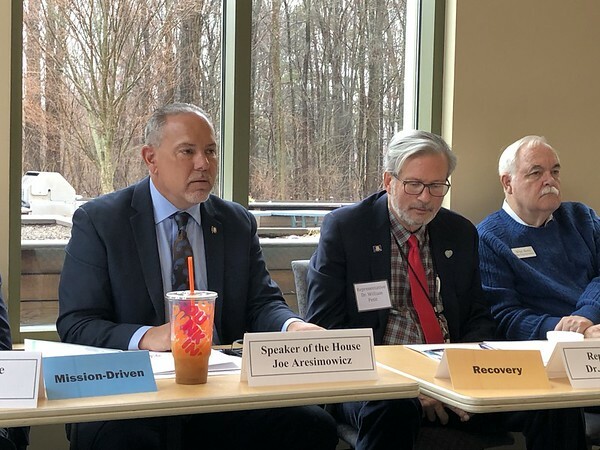 NEW BRITAIN - Several state legislators spent Thursday morning away from the Capitol to meet with service providers in the state about their concerns and hopes for the 2019 General Assembly session. The group - House Speaker Joe Aresmowicz, D-Berlin, state Rep. William Petit, R-Plainville, state Rep. Whit Betts, R-Bristol, state Rep. Derek Slap, D-West Hartford, state Rep. Cathy Abercrombie, D-Meriden, state Rep. Kerry Wood, D-Rocky Hill, state Rep. Rick Lopes, D-New Britain, and state Sen. Matt Lesser, D-Middletown - met at CCARC on Thursday to hear from nonprofit organizations and service providers like the Bristol Adult Resource Center and Wheeler Clinic. “Private providers give people a life and a community,” said Anne Ruwet, CEO of CCARC. CCARC is a New Britain-based nonprofit providing services to nearly 200 adults with disabilities in the region. Ruwet invited 12 other organizations who provide services to at-risk individuals to share stories, ideas and concerns with the panel of legislators. Much of the discussion centered around what legislators have done in the past to help private service providers and what they hope to accomplish in the future. Several speakers talked about how uncertainty around funding affects their day-to-day operations and several emphasized the need to clarify language in grants that are issued to these organizations. Many providers also aired concerns. Mary Etter from the Bristol Adult Resource Center said a minimum wage increase to $15 would severely hurt her organization and those of similar size. “Not only will that impact what we’re now paying our staff - because the minimum wage that’s being proposed is more than we’re now paying our staff - but it’s going to make it that much more difficult to find employment for the people that we support,” Etter said. Beth Fisher from Kuhn Employment Opportunities also said she had concerns about a minimum wage increase and how the state would help offset the cost of the increase for these organizations. Following a few more comments related to the minimum wage, Aresimowicz clarified his stance on how an increase would happen. “It wouldn’t be an immediate jump, it’s going to be anywhere from a three to six-year phase-in,” Aresimowicz said. 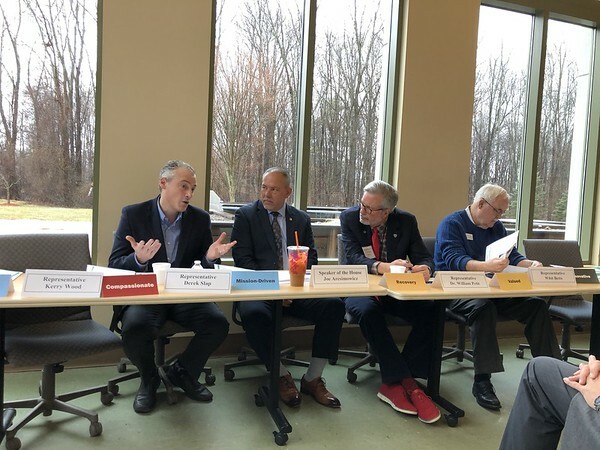 Aresimowicz said he understands there will have to be discussions about how employees are paid as well as talks about how a minimum wage increase would affect clients who are in workforce programs with their service providers. “We get it, and we’re going to account for that in our talks,” Aresimowicz said. Wendy DeAngelo, vice president of development and communications at the Hospital for Special Care, thanked legislators for their past support, but emphasized organizations like HSC need to be protected from bills that could harm the services they provide. Betts thanked the crowd for bringing their concerns and comments to the panel. He encouraged stakeholders to keep in contact with legislators to fill them in on how laws and funding affects their organizations. He also encouraged organizations to continue fundraising independently in case state and federal funding continues to diminish. “That is the number one recognition I would give to everybody. We really want to help everybody, but the reality is we can’t,” Betts said. Lesser disagreed with the sentiment that these organizations shouldn’t rely on government funds, though. “We need to find ways to support you,” Lesser said. Several nonprofit organizations from across Central Connecticut partnered with CCARC to host Thursday’s forum, including: Adelbrook, Bristol Adult Resource Center, Community Mental Health Affiliates, CW Resources, HARC, Farrell Treatment Centers, Klingberg Family Centers, Kuhn Employment Opportunities, MARC Community Services, MOSAIC, Residential Management Services, Wheeler Clinic and The Alliance. Posted in The Bristol Press, General News on Thursday, 7 February 2019 18:28. Updated: Thursday, 7 February 2019 18:30.